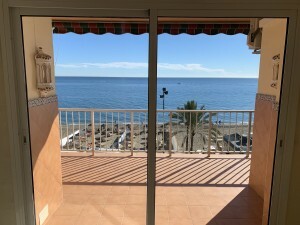 Ideal family home with large sunny terraces and panoramic sea views located in a quiet and residential area in El Faro only 10 minutes walking distance to the beach. First Floor: Large sunny porch, entrance hall, guest toilet, 3 bedrooms with on suite bathrooms, open plan kitchen, staircase, large dining area with fireplace and double sitting area with direct access to the sunny patio. On the same level, an additional room currently used as a TV area has been added recently by closing the garage. 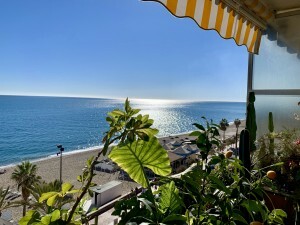 Upper floor: Master bedroom with on suite bathroom and small dressing area with access to a lovely corner terrace offering panoramic sea views of the coast and urbanization. Exterior: Storeroom with washing machine, recently added separate extra room, large sunny patio around the house offering partial sea views. 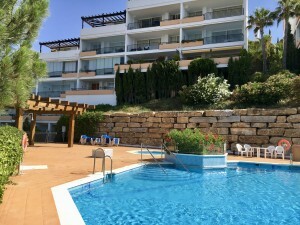 The property has been refurbished and modified by the current owner since 2009. Inspired by Moroccan style and ideas, it has terracotta tiles all the way through the house, handcraft Moroccan sinks in each bathroom, underfloor heating in all the house, amazing views, fully equipped kitchen and a community pool.